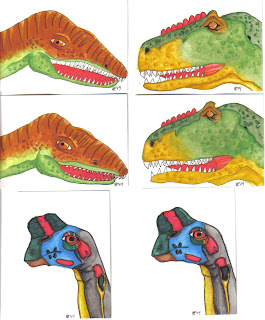 These are some dinosaur artist trading cards I made for a swap on a Yahoo group. I used ink, acrylic and watercolor. This is the first time I went out of my comfort zone to draw and paint something I normally would not have wanted to or felt comfortable doing. I am happy with the results. 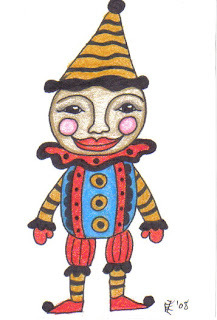 Vintage Clown artist trading card made using color pencils. 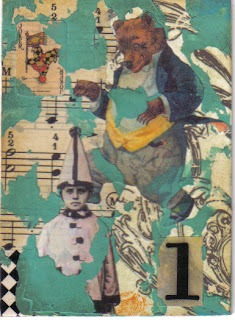 This is one of my more recent artist trading cards. It is a collage using the vaseline (petroleum jelly) resist technique and acrylic paints. I call it "Circus Boy". Yes, I have made another two paper dolls :) These were made for a private ATC swap. I trade with this particular person frequent. She does some wonderful origami ATCs! 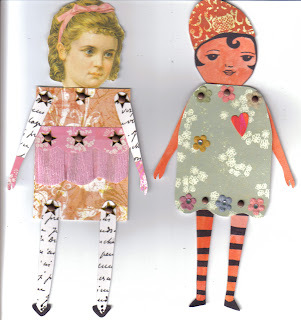 The names of these paper dolls are Vintage Star and Lil' Babushka. Lil' Babushka is a collage doll that I make on an artist trading card by cutting out a dress shape, a head wrap and then drawing in the legs, arms and face, but here I actually made her into an ATC size paper doll. Both paper dolls have moveable arms, legs, and heads.